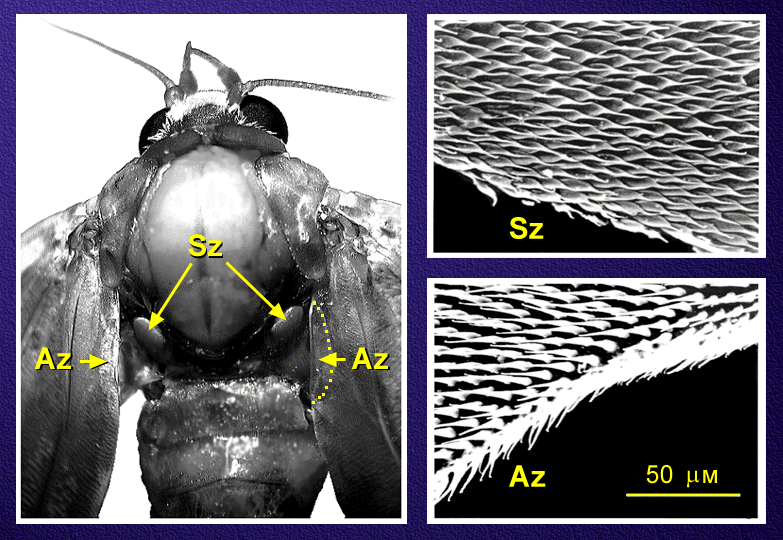 Many moths produce high-frequency short ultrasonic clicks. It is rather easy to record them. 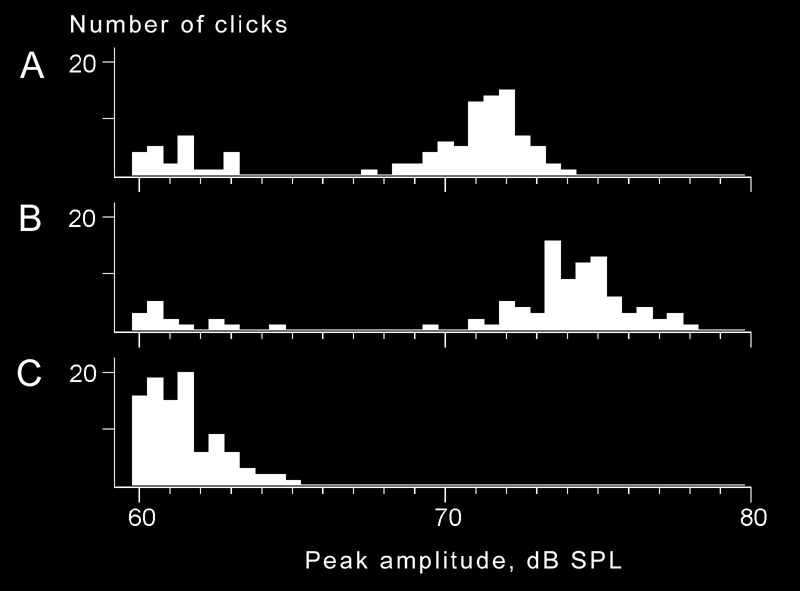 Sometimes a young man with a good hearing can perceive these clicks from a short distance because a small part of a click energy falls below 20 kHz while the amplitude of a click is about 80 dB. They look like quiet electric discharges. A moth photograped at the moment of click production. 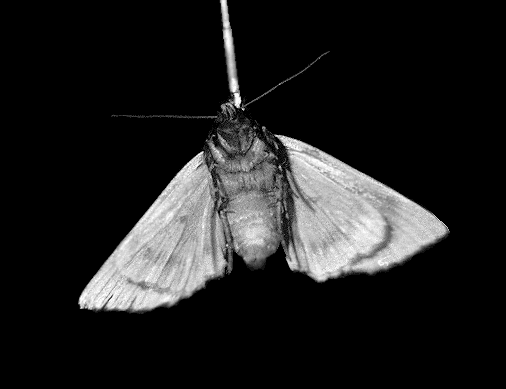 Noctuid moths produce ultrasonic clicks during flight. Peak amplitude of these clicks varies from 70 to 84 dB SPL in 5 cm from the moth, the duration is about 100 µs. 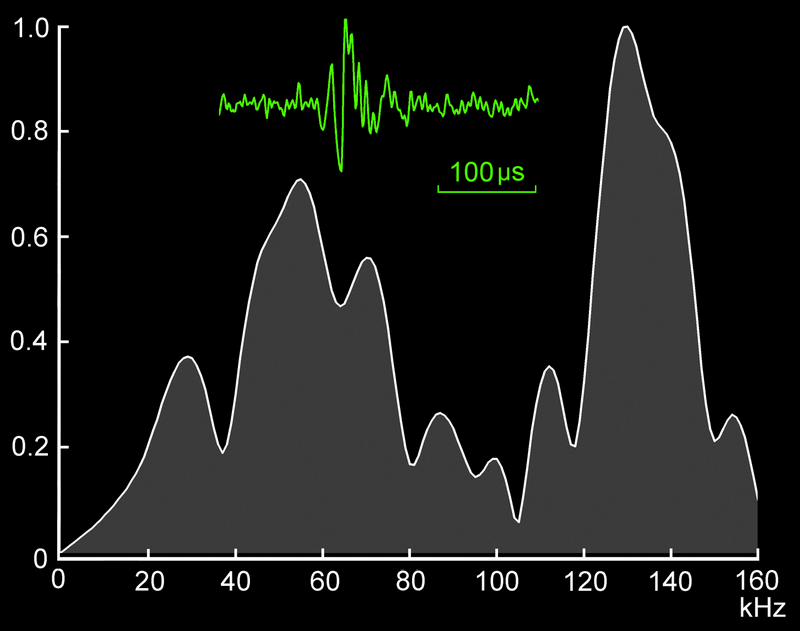 Clicks have a very variable waveform and a broad-band (more than 100 kHz) spectrum. In 1997 we have managed to record moth clicks in natural conditions. The regular pattern of clicks - one per second or on every third wingbeat - is often observed in the condition of tethered flight and naturally. A photograph of a device we used to record clicks from moths flying in natural conditions. 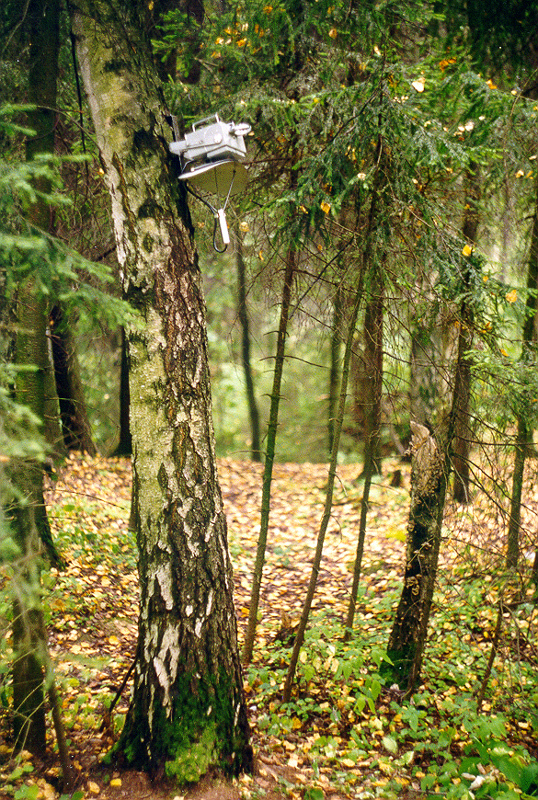 The acoustic locator is fixed on a birch trunk 2 meters above the ground. The microphone is situated in front of the parabolic mirror which is attached to the electronic block part. One meter below the locator the birch cortex is greased with an attractant for noctuid moths (mixture of beer and honey which started to ferment). Moths flying up to the birch get into the area of locator sensitivity. The recorded clicks are broadcasted to the FM receiver situated within the laboratory room. Click on the image above to download an example of noctuid moth's clicks. 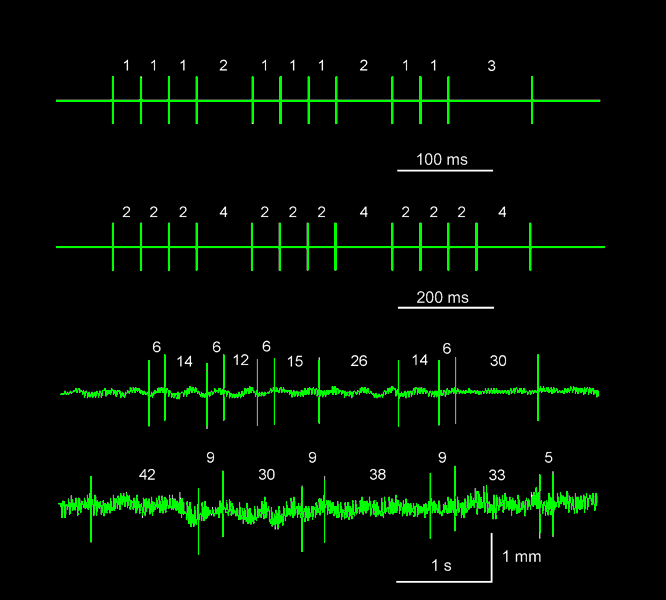 Ultrasonic clicks are converted into the human hearing frequency range. Upper two lines: moths were flying attached to a thin wire (in so-called "carousel" setup). Lower two lines: tethered flight with the horizontal movements recording. Numbers above the lines indicate the intervals between two clicks measured in wingbeats (one wingbeat is ca. 25 ms). Note the different time scale. After Roeder and Treat who reported in 1957 that noctuids emit ultrasonic clicks, the investigation of sound production in moths was continued by Kay and Agee. Kay (1969) suggested that the generators of clicks were of a tymbal type and were situated bilaterally on episternites, like in close related family of arctiids (Arctiidae). However, using stroboscopic observation of flying moths, Agee (1971) concluded that the acoustic pulses recorded by Kay either were produced due to the bang of one wing on the other at the highest point or were artifacts. Later, the conclusions of Agee were also revised. 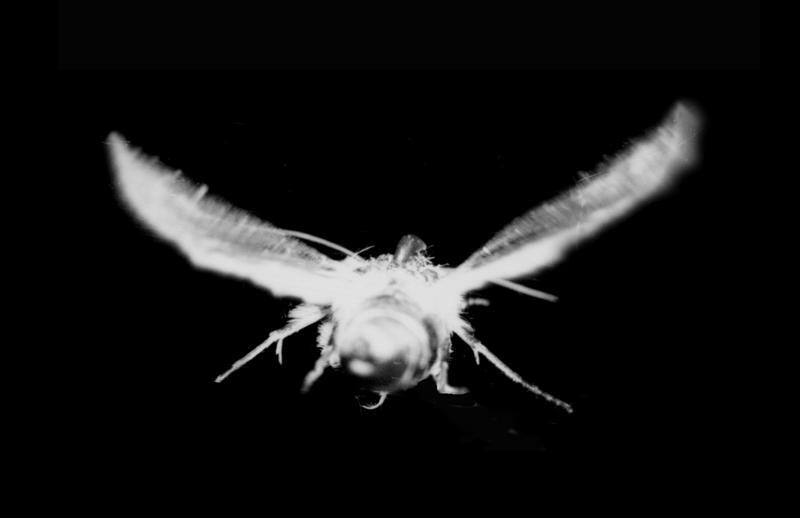 By means of photographs of flying moths which were made synchronously with click emission, it was shown that, at that moments, the position of wings was close to horizontal (Lapshin et al., 1993a, see the photo above). This finding contradicts the models of emission mechanism suggested by Agee. It should be noted that, in noctuid moths, short ultrasound clicks could really be produced during touch of the hind wings at the highest point (Waters, Jones, 1994) but, as a rule, their amplitude does not exceed 65 dB, i.e. they are weaker than the clicks registered by Roeder, Treat, Kay, Agee and Lapshin by 10 dB (3 times), at least. In fact the structures which, as we know now, are used by a moth to produce short and loud ultrasonic clicks were described in 1974 by P.J.Kuijten. He described them as a coupling mechanism between wings and metascutum serving to assure a close connection between wing and thorax when the moth is at rest. Later we have re-described the same structures as a mechanism for sound production in moths (Lapshin, Vorontsov, 2000). There are two laterally symmetrical pairs of adjacent to each other areas - one is situated on the ventral surface of the base of the forewing, the other one is on the metascutum (see the figure below). The surface of these areas is covered with cone-like structures. While uncoupling, these structures produce loud ultrasonic click. It works just like a velcro. Moths with these areas removed are not capable of emitting clicks. A, B: intact Amphipyra perflua moth, successive data from a single experiment. C: the same moth, with coupling areas removed. 100 clicks per each plot. The low-amplitude noise pulses which accompany the wingbeats are still present in C, but the high-amplitude clicks totally disappear after the sound production mechanism has been removed. 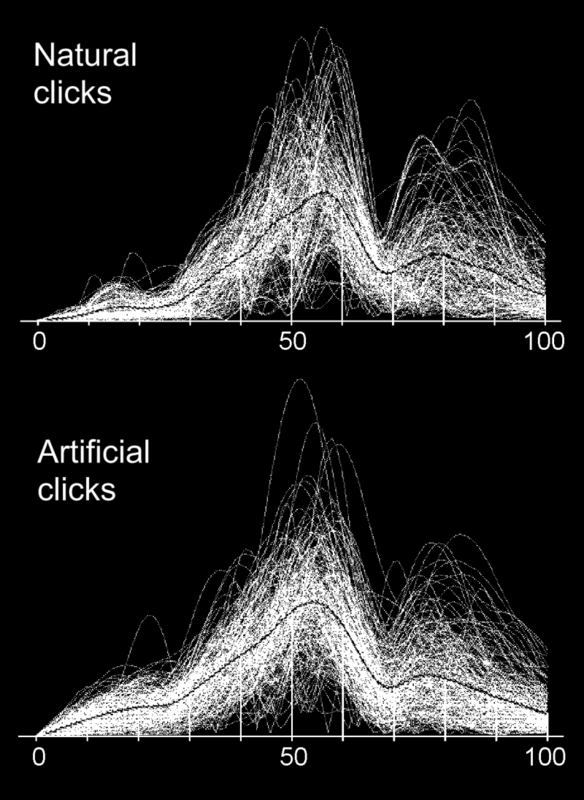 Artificially generated clicks (when the areas were uncoupled manually) have almost the same frequency spectrum as the natural ones have. Kuijten P.J. (1974) On the occurrence of a hitherto unknown wing-thorax coupling mechanism in Lepidoptera // Netherlands J. Zoology. V.24. �3. P.317-322. Lapshin D.N., Vorontsov D.D. (2000) Ultrasonic emission in noctuid moths (Lepidoptera, Noctuidae): main characteristics of signals and possible mechanisms of their generation // Zool. Zhurn. 2000. V.79. N�10. P.1189-1202. Translation: Entomological Review. V.80. No9. P.1157-1169.